These web pages are a pictorial essay of one individual's train journey across the Tibetan High Plateau at the end of the northern Autumn, 2006. Riding across the top of the world on the Tibetan high train, thoroughly enjoying the experience, it seemed so easy. But in attempting to research, plan and arrange it, it had seemed so intangible with good information difficult to obtain. It was the intention to provide information for independent travellers about the preparation and organistion for the train trip, but time has passed and circumstances have changed. 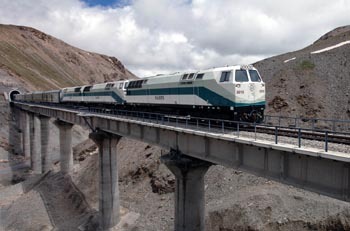 Train to Lhasa, November 2006. The new train heading for the Tibetan High Plain. The Chinese train across the Tibetan Plateau to Lhasa is controversial in the West. It also causes excitement and wonderment because of the extreme environment it passes through. There also seems to be a lack of information about the countryside the train traverses. It is not the intention of this web site to become involved in the debate about the train to Lhasa. Rather it is our aim to simply present what was seen to give viewers an idea of what the Tibetan Plateau is like. Nevertheless, we will make some tentative observations about possible impacts of the railway towards the end. However, we hope you will first look at what was seen from the railroad across the Tibetan High Plateau. We had perfect weather for the train journey and the Plateau was totally different to what had been imagined.